When I was developing my Writing from the Self workshops, I was inspired partially by Proprioceptive Writing. But what is traditional PW like? Here is a description based on my own experiences with it. The candle flickered before me and the other workshop members as we sat around the table. Baroque music rolled and danced in the background. We each had a stack of unlined paper, and we wrote. For about 25 minutes we wrote whatever thoughts blazed through our minds. Over and over, during the process, we paused to ask ourselves what we meant as we wrote certain words, and then we recorded the answers to that question. In this way, we "listened" to ourselves thinking. Then our instructor gently blew out the candle and asked us to put down our pens. She turned off the music. The room was silent; no one wanted to speak right away. I felt electric, buoyed and relieved. I sensed that everyone in the room felt as I did, that we had accessed something very important within ourselves. After reading the piece out loud I felt even more vital and enthralled. The instructor explained that another part of the brain gets stimulated when you read your own words aloud. And it was true; all the elements of the experience, put together, seemed to open a channel between my daily, busy, un-thinking self and the deeper parts of me. It was like I had realized a whole new ability to see and understand myself. The developers of the method are Linda Metcalf, PhD, and Tobin Simon, PhD. In their 2002 book, Writing the Mind Alive: The Proprioceptive Method for Finding Your Authentic Voice, they explain the theory behind the process. The proprioceptive system in our body is described as a "sixth sense" in which nerves, called proprioceptors, communicate back and forth with the brain, orienting the body to its own movements and position. In this way we know where our legs are when we are walking, and we know how to reach for a flower when we want to pick it. The authors state that the proprioceptive system may also be viewed as the interface between body and mind. They write, "When we call our method Proprioceptive Writing, we are using the term metaphorically, comparing the mind's capacity to know itself to the body's." Metcalf and Simon liken this writing method to meditation because the writer must listen mindfully to her own thoughts, focusing attention and blocking out all other stimuli. They compare the practice to therapy by saying that one forms a new path of communication between the intellect and the heart; one explores and questions the assumptions that have become fixed in the mind. 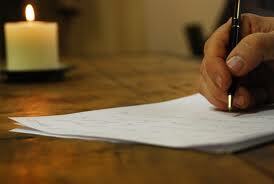 Many have experienced the benefits of Proprioceptive Writing by attending workshops. However, the authors note that it's very appropriate to carry it out at home -- perhaps similarly to the way that some people keep a journal. Indeed, they advocate for a regular, daily practice of 25 minutes. They say that part of the power of the process is in the safety of the ritual. • First, you'll need to establish a block of alone-time (about half an hour) and a quiet place to be. If you live with others, make sure they understand the importance of giving you this space. • Light a candle and place it on a firm surface in front of you. Metcalf and Simon write that the candle generates "a luminous glow that can quiet your mind, focus your attention, and help you turn inward." • Gather a few pieces of unlined paper – this helps you remember to let go of the regular rules about writing. • Set a timer for twenty-five minutes and begin writing. "Imagine your thoughts as spoken words and write them exactly as if you could hear them, as they occur to you moment by moment,” the authors say. They go on to explain that you should not be writing for an audience; this is for you alone. • As you go along, "listen to what you write." To do this, you use the Proprioceptive Question: "What do I mean by _________?" Into the blank goes whatever word or phrase catches your attention. Then write what you "hear" in response to the question. For example, in my piece quoted above, I wrote, "What do I mean by 'lost?'" That question led me to describe images that I hadn't been aware were in my mind. In fact, it was interesting and helpful to me to find that "being lost feels kind of good." • What thoughts were heard but not written? • How or what do I feel now? • What larger story is the Write part of? • What ideas came up for future Writes? The authors explain that this is often when revelations occur. For writers and other artists, these questions can also help spark future work. I find the method fascinating and incredibly useful, and I invite others to try it for themselves!